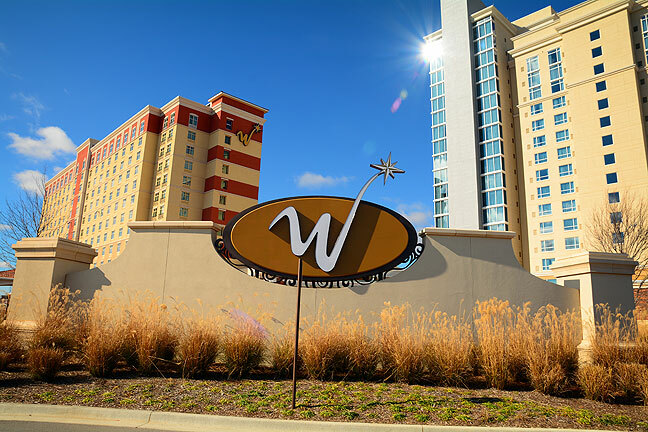 This is the main entrance to Winstar World Casino. Abby and I just returned from a Christmas excursion to Winstar Casino in Thackerville, Oklahoma. Abby’s best friend Sharon had some free rooms, so she invited us to tag along. 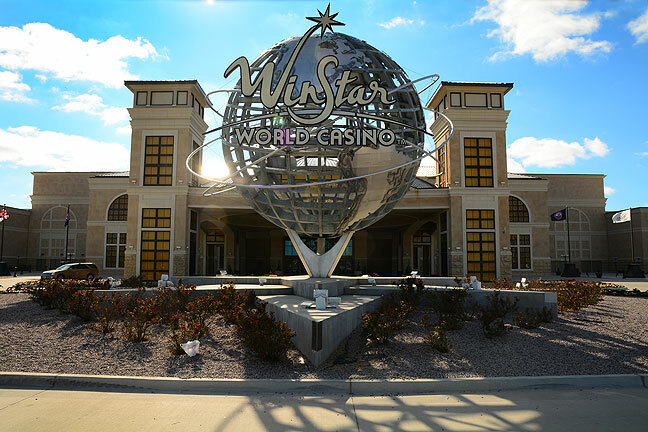 She hadn’t been to Winstar for some years and it has grown by leaps recently, so she wanted to try it. Winstar is noted as one of the largest casino floors in the world, and after visiting, I would believe it. We stayed at the hotel at one end of the casino, and on the first night of our visit, I walked the length of it, and it took me 30 minutes to the end and back. And as my fans know, I am a very fast walker. Our room was on the twelfth floor, which afforded views of the countryside. 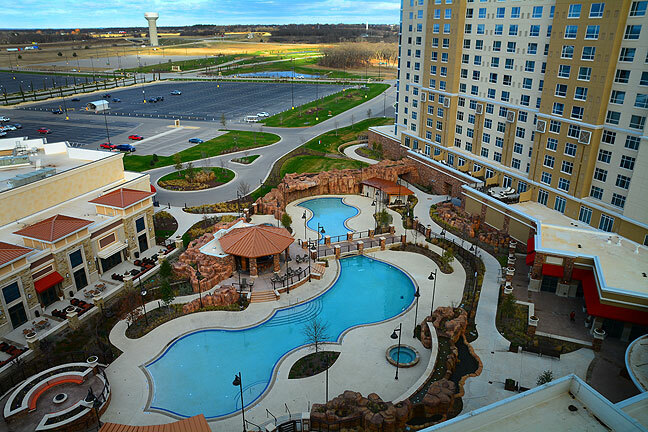 Winstar is in Thackervile, Oklahoma, just one mile north of the Red River and the Texas border. The casino itself is populated mostly with machine gambling, versus live games of chance like poker, roulette, or blackjack. There were a huge number of slot machines, but also other games like video poker and keno. Abby and Sharon played video poker almost exclusively. Their game is “Double Double Bonus” poker, which they claim pays out better. Abby looked sweet and soft on Christmas morning, so I made this image of her in window light in our hotel room. The Gran Via Buffet was excellent, with a large selection of hot, well-cooked, tasty foods of many cuisines. The Matadors Pizza made me a nice veggie calzone, as well as a very nice slice of Alfredo Florentine pizza. The Terrace View Café seemed understaffed, and took too long to serve us. Since the Chickasaw Nation owns both Winstar and Bedré Chocolates, staff gave us chocolate samples every chance they got. Since the gaming was mostly machine gambling, the clientele tended to be the “nickel slot” crowd: older, smokers (or vapers), physically unfit, unhappy. Looking in their eyes as I walked, I got a sense of despair. The one time Abby played a slot machine called “Lucky Ducky,” she got excited like a kid, clapping and cheering, “Come on, Ducky.” It was pretty cute, and it worked, because she hit something big and immediately cashed out. Center kiosks featured free soft drinks and coffee. I drank the coffee, which was pretty good. I though about buying a glass of wine or a beer, but like most bars and pubs, the cost per drink was quite high. A bit to my surprise, on both Christmas Eve and Christmas Day the place was jam packed, with literally thousands of gamblers. This is our hotel. The tower on the left, where we stayed, connects directly to the casino. Sharon and Abby both felt disappointed by the rooms, which were nice, but didn’t compare with their favorite casino, Quapaw, Oklahoma’s Downstream. Though I don’t care for either, valet and bellhop services were available. I spent more time walking and watching than gambling, and made a few photos while I was about, including a lovely image of my wife. Casinos say they don’t permit photography on the gambling floor, which I believe is to keep patrons and investigators from discovering how they cheat. Still, I saw several people making phone selfies. Although it wasn’t an entirely positive experience, I’m glad I was able to spend the time with my wife. Sharon is a much more dedicated gamer, so Abby and I had plenty of alone time. It was nice. 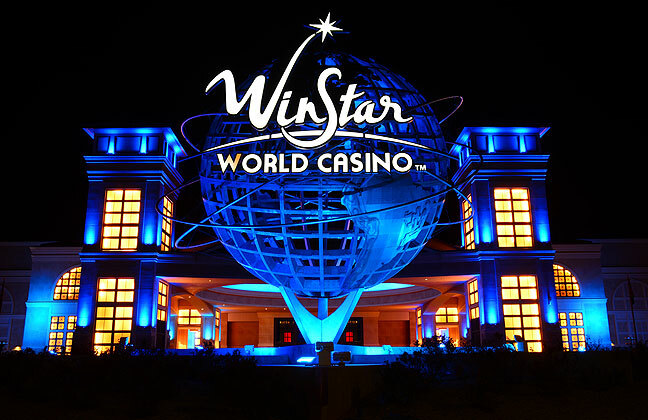 This is the main entrance to Winstar World Casino at night. Compare it to the daytime image at the beginning of this post. 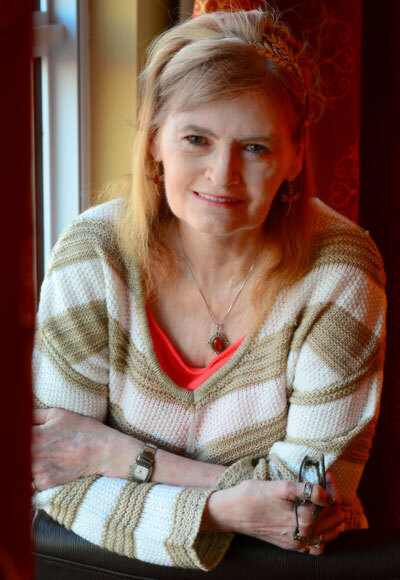 Abby looks gorgeous in that photo. Ah, then we were probably within a couple hundred yards of you on the 24th, depending on when you arrived. We were heading south on I-35 and passed the casino at 10:55 a.m. (and stopped for 15 minutes at the Gainesville rest stop just across the border). (1) as you noticed, they do permit selfies with phone cameras though. I’ve noticed this same dichotomy in many businesses. (2) In March 2004, the Seminole Nation reopened their casino at 99 and I-40, and invited the newspaper (me) to cover the event, specifically mentioning photographing their new machines inside. When I arrived, the guards on site hadn’t heard of this invitation and wanted me to get *only* the ribbon-cutting outside. I was pretty snotty about it and refused to cover the ribbon-cutting until they let me inside with the camera (where I got a pretty crappy photo), saying the only reason we’d come was the chance to go inside; they could have sent us the ribbon-cutting photo themselves. Before we went to press, they called and begged us not to publish the interior photo, saying they’d given permission “by accident”. I don’t remember if we ran it or not. And yes, that is a particularly well-done photo of Abby. I’m glad all of you had an enjoyable time. That places exterior has always fascinated me with its around-the-world architecture. It would be cool if the interior of each section matched up. Theplaying site is composed of all its casino brands. character symbols act as Scatters and further spins can be awarded.